Appearing this week were the departments of Environmental Protection, Agriculture, Corrections, General Services, Health, Drug and Alcohol Programs, and Military and Veterans Affairs, along with the Liquor Control Board and the Office of Attorney General. On the agenda for the third and final week of budget hearings are full days for the departments of Education and Human Services, along with the Pennsylvania State Police, Office of Homeland Security, Office of Inspector General, and Gaming Control Board. The final day will feature Budget Secretary Randy Albright. The hearings can be viewed live at www.PAHouseGOP.com, with archived videos posted within 24 hours of the hearing. The issue of school safety and security, especially the prevention and handling of active shooters and other emergency situations, was one of the discussion topics at a meeting of the House Veterans Affairs and Emergency Preparedness Committee this week. In Pennsylvania, schools are required to have an emergency plan, but that may or may not cover active shooter situations. Under Act 55 of 2017, schools are encouraged to conduct at least one security drill per school year in each school building. The security drills may be used in place of one of the school’s monthly fire drills. In further discussion on this serious nationwide issue, the House Education Committee will hold a day-long hearing on March 15 to examine further prevention methods. Members of the House Agriculture and Rural Affairs Committee this week met with state Agriculture Secretary Russell Redding and other leaders about the challenges facing the dairy industry and efforts to overcome them. A major focus of the discussion was an ongoing study of the industry, commissioned by the department and the Center for Dairy Excellence, which has indicated investing in additional dairy processing capacity in the Commonwealth could generate as much as $34.7 million annually in combined revenue generation and cost savings. Information about the study is available here. Other suggestions for improvement included capitalizing on branding and marketing opportunities, improving regulatory processes and the business climate, broadening workforce development and education opportunities, and investing in broadband infrastructure. More than a third of the state’s agriculture revenues come from the dairy industry; however, many of these mostly family-owned farms are struggling because of an oversupply of fluid milk in the market and persistently low prices. Other challenges discussed in the meeting include regulatory issues and permit delays. With March being observed as National Problem Gambling Awareness Month, officials from the Department of Drug and Alcohol Programs, the Pennsylvania Gaming Control Board and the Pennsylvania Lottery discussed the warning signs of problem gambling and highlighted available resources to help with a gambling addiction. In the Commonwealth, the Council on Compulsive Gambling of Pennsylvania works to educate Pennsylvanians on compulsive and problem gambling to prevent development of dangerous gambling habits. It operates the Pennsylvania Problem Gambling helpline, 1-800-GAMBLER (1-800-426-2537). More resources, including a 24-hour chat service, are also available at www.pacouncil.com. For more information on how to recognize the warning signs of a gambling problem and to find treatment options around Pennsylvania, visit www.ddap.pa.gov or www.paproblemgambling.com or call 1-877-565-2112 to reach the state’s problem gambling helpline. 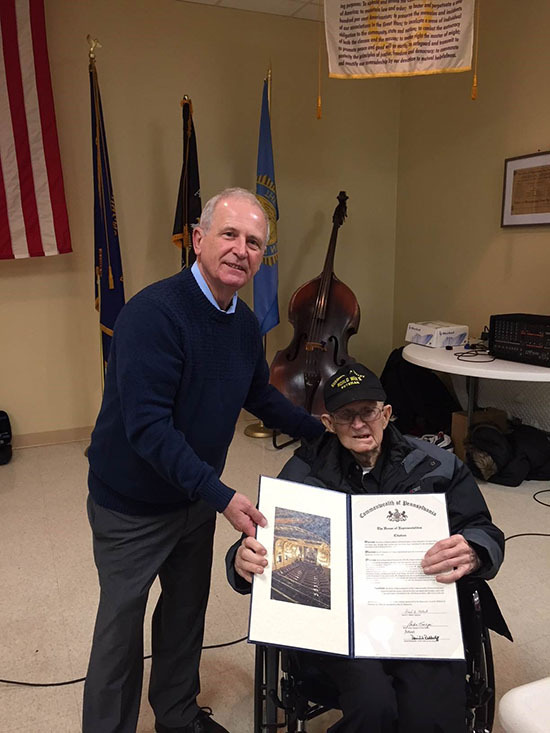 It was my honor to present World War II veteran Roy Kilpatrick with a House citation in honor of his 100th birthday. I am pictured with FFA members who were recognized for being awarded their PA FFA Association Keystone Degree at the 2018 Farm Show. Members, their parents and FFA advisers attended the event at Benton High School. 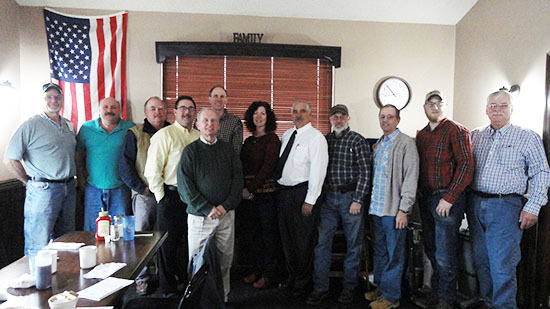 Thank you to all who attended our Farmers Breakfast last Friday. Pictured with me are Boz Robbins, Jim Levan, Charlie Porter, Rob Davidson, Jeff Giger from Team Ag, Mindy Freeman from PennAG, Columbia County Commissioner David Kovach, Cliff Miller, Jim Chapin, Steve Chapin and Delroy Artman. Missing from photo are David Artman, Helen Artman and John Zaginaylo. • Farming Safety Day will be held at the Bloomsburg Fairgrounds on Saturday, March 3, from 10 a.m. to 2 p.m.